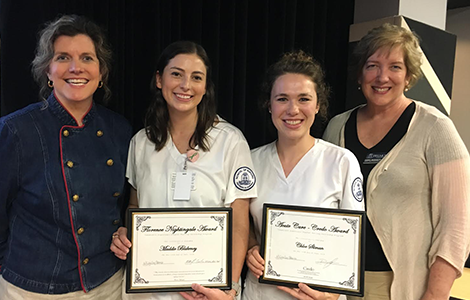 A Trevecca nursing student received a Credo Award on June 23 after completing the seven-week Vanderbilt Experience: Student Nurse Internship Program (VESNIP). Chloe Sliman, a senior, received the award in the acute care track. The Credo Award acknowledges individuals who display excellent performance and communication, respect, commitment and other behaviors that the Vanderbilt University Medical Center (VUMC) professionals uphold. The summer program recognized one student for each of the seven individual tracks. “I felt extremely honored. I had no idea I was going to be the one to receive it. I think there were 60 [students] in all and so I thought any number of us could have received it,” she said. The VESNIP is in its fourteenth year and is in partnership with four area nursing schools including Belmont. Trevecca’s partnership with Belmont’s nursing program gives students access to the program. The VESNIP gives nursing students the chance to work in a professional environment through 250 clinical hours. Sliman says being able to work 12-hour shifts three days a week was “invaluable” for her training as a nurse. Prof. Ellen Musick, Trevecca nursing program coordinator, says the Credo Award is the highest honor VUMC gives to their employees. “To be singled out at such a young age… while [Sliman’s] even a nursing student, this says everything about her character and the kind of nurse she’s going to be,” Musick said. Students in Trevecca’s nursing program will take all their general education courses and their nursing preparatory courses at Trevecca before attending their last two years at Belmont. Musick says the award given to Sliman means Trevecca is sending competent nursing students to Belmont. Sliman says having to go to both institutions gave her the opportunity to meet new people and work in different environments, allowing her to gain two different support systems. “I think I’ve got the best of both worlds,” she said. Sliman is the first member of her family to attend nursing school, and while the lack of general knowledge before entering college was challenging, she says the internship program at Vanderbilt helped fill that gap.